Iolite: Gem-quality cordierite and blue sapphire look-alike. Cordierite and the Gem Known as "Iolite"
Cordierite is the mineral known as "Iolite" when it is of gem quality. 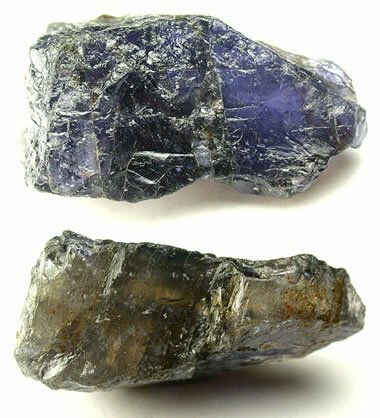 Iolite: A blue-violet iolite faceted from material mined in Madagascar. This specimen is approximately 9.4 x 7.1 x 4.8 millimeters in size and weighs about 1.83 carats. 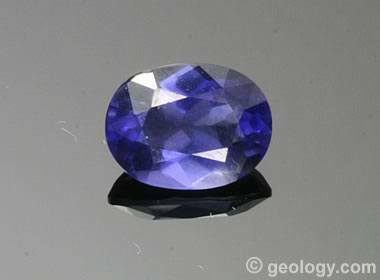 A nice iolite like this one could easily serve as an alternative gem for sapphire or tanzanite at a much lower price. Cordierite crystals: A cluster of cordierite crystals from the Richmond Soapstone Quarry in Cheshire County, New Hampshire. The crystals are short and prismatic with a square cross-section. The cluster is about 19 centimeters tall. Specimen and photo by Arkenstone / www.iRocks.com. Cordierite is a silicate mineral that is found in metamorphic and igneous rocks. It is typically blue to violet in color and is one of the most strongly pleochroic minerals. Cordierite has a chemical composition of (Mg,Fe)2Al4Si5O18 and forms a solid solution series with sekaninaite, which has a chemical composition of (Fe,Mg)2Al4Si5O18. "Cordierite" is a name used by geologists. When the mineral is transparent and of gem quality, it is known as "iolite" in the gem and jewelry trade. Two older names for the mineral are "dichroite" and "water sapphire." The name dichroite means "two-color rock," inspired by cordierite's pleochroic property. The name water sapphire is also related to pleochroism. 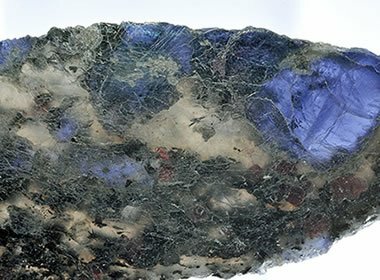 It was used because a specimen could have the color of a sapphire when viewed from one direction, but if the stone was rotated it could appear to be as clear as water. Most cordierite forms during regional metamorphism of shales and other argillaceous rocks. When formed under these conditions, it is found in schist and gneiss. Less often, it forms during contact metamorphism and is found in hornfels. Cordierite is also found as an accessory mineral in granitic igneous rocks and in pegmatites. When crystals of cordierite have the opportunity to grow without obstructions, they can form short prismatic crystals with a rectangular cross-section. In metamorphic rocks, cordierite is often found associated with sillimanite, kyanite, andalusite, and spinel. Most gem-quality iolite is produced from placer deposits, where it occurs in association with other gems even though its specific gravity is not high enough to cause a concentration. When exposed to weathering, cordierite alters to mica and chlorite. Cordierite pleochroism: One piece of cordierite from the Tulear Province of Madagascar, viewed from two different angles that display its pleochroism. The top image shows the specimen from its angle of maximum violet color. The bottom image shows the same specimen rotated by an angle of 90 degrees to show a yellowish color. This specimen is about 4 centimeters in length. Photos by John Sobolewski, displayed here under a Creative Commons license. Color Strongly pleochroic. Most specimens appear blue to violet in color but can be clear, gray, or yellow from other directions. Uses Very few uses; used rarely in ceramics. Transparent specimens are sometimes used as gems. 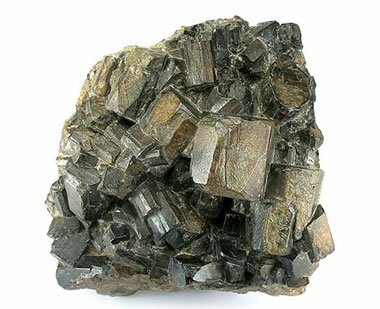 Cordierite is a mineral with very few industrial uses. It can be used as an ingredient for making ceramic parts used in catalytic converters. However, synthetic cordierite is used instead because its supply is reliable and its properties are consistent. Many other natural materials are losing their place in industry to synthetic materials for these reasons. Pleochroism in iolite: This video demonstrates pleochroism in iolite. Pleochroic materials appear to be different colors when observed from different directions. In this video we watch a rotating piece of iolite change colors between blue and clear with every 90 degrees of rotation. The color of the specimen depends upon the angle of observation. People who facet iolite must study the stone and determine its direction of best color. Then the stone is cut with its table at right angles to the direction of best color observation. That will produce a finished gem that exhibits its best color when viewed in the face-up position. When transparent and of high clarity, cordierite is used as a gemstone. It is known as "iolite" in the gem and jewelry industry. Iolite is a blue pleochroic gem that has an appearance similar to sapphire and tanzanite. It can serve as an alternative stone to either of these gems and is much lower in price. Unlike sapphire and tanzanite, iolite in the gem market is not known to receive heat, irradiation, or other treatments to improve its color. That is appealing to many people. Iolite is a challenging material to facet because of its extreme pleochroism. The cutter must examine the stone carefully and have its axis of top-quality color oriented perpendicular to the plane of the gem's table. A gem of good color can only be obtained if these cutting rules are followed. Faceted iolite gems weighing more than five carats are rare. Most stones are two carats or smaller. These small stones often have the best color because iolite often has a dark tone. Iolite has a Mohs hardness of 7 to 7 1/2, which is durable enough for many gem uses. Its main physical disadvantage is its distinct cleavage in one direction. This makes it vulnerable to breakage when used in rings or other items that could encounter rough use. Iolite is almost never seen in mass-merchant jewelry. It is a gem that is unknown to the average consumer because it is not being marketed. Jewelers do not order it or market it because they are not confident that an abundant supply of quality material will be available to support them. This is surprising because significant iolite resources exist in many countries. Its value in the gem trade has not been developed and thus its price is low. Cordierite crystals in matrix: A photo of cordierite crystals in their rock matrix from Minas Gerais, Brazil. Photo by Parent Géry, used here under a Creative Commons license. Pleochroic materials appear to be different colors when viewed from different directions. When viewed from the direction that produces its most attractive color, most cordierite is a distinct blue to violet in color. 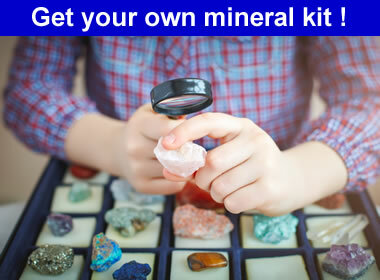 It is one of the most strongly pleochroic minerals. Specimens that produce a strong violet color can be rotated to produce light violet or dark yellow hues. Specimens that produce a strong blue color can be rotated to produce yellow or colorless hues. People who facet iolite must study the stone to determine its direction of best color. Then they must facet the stone so that the direction of best color observation is at right angles to the table of the stone. That will produce the best possible color in the finished gem. See the video on this page for a demonstration of pleochroism in iolite.